London (CNN Business) 1. China tensions: China’s yuan slumped to its weakest level in a decade on Tuesday. It’s now trading at around 6.97 to the dollar. The battle flared again Monday after the Trump administration banned Fujian Jinhua Integrated Circuit Company, a state-backed Chinese chipmaker, from buying American parts. The weakening yuan could lead to yet more acrimony. The exchange rate is creeping closer to 7 yuan to the dollar, which is seen as a key psychological threshold for traders and could be the trigger for renewed attacks by President Donald Trump. Trump has previously accused China of deliberately devaluing the currency. 2. Volkswagen slows: New European emissions tests that came into effect in September have dented sales and production at Volkswagen. 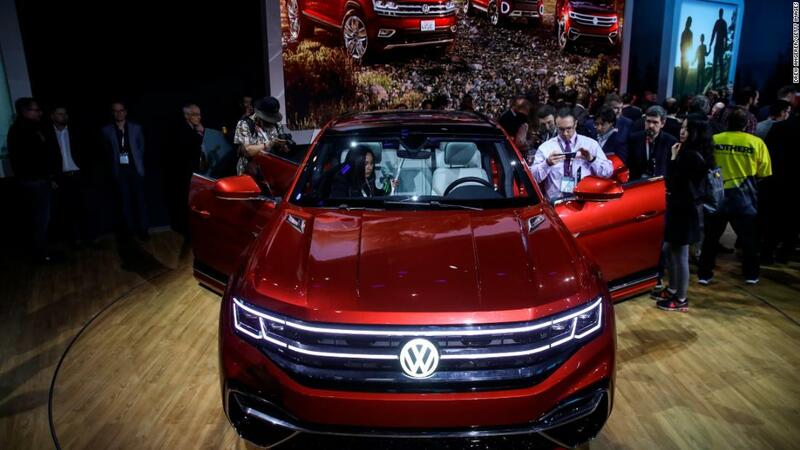 Sales in the third quarter declined 3.6% over the previous year and production dropped 8.2% as Volkswagen struggled with the changeover. Shares in Volkswagen (VLKAF) are down 12% so far this year. The stock has been hit by the uncertainty around regulation of diesel and electric cars, trade tensions and fallout from its company’s diesel emission scandal. 3. General Electric: General Electric (GE) is cutting its 119-year old dividend to just one cent beginning in 2019. It was most recently 12 cents per share. The deeply troubled company said the move will save it $3.9 billion in cash each year. GE also reported worse-than-expected results, including a $22 billion accounting writedown for its beleaguered power division. It was the first earnings report under new CEO Larry Culp. The struggling multinational firm desperately needs new direction — it has shed half a trillion dollars from its market value over the past 18 years. European markets opened lower, following a mixed session in Asia. The Dow swung wildly on Monday and closed down 1%. The S&P 500 dropped 0.7% and the Nasdaq shed 1.6%. 5. Companies and economics: Aetna (AET), Baker Hughes (BHGE), BP (BP), Coca-Cola (KO), Ecolab (ECL), Fiat Chrysler (FCAU), General Electric (GE), Honda Motor (HMC), MasterCard (MA), Pfizer (PFE), Sony (SNE) and Under Armour (UAA) will release earnings before the open. Baidu.com (BIDU), Cheesecake Factory (CAKE), Denny’s (DENN), eBay (EBAY), Electronic Arts (EA), Facebook (FB), Herbalife Nutrition (HLF), Hyatt Hotels (H), MGM Resorts (MGM), T-Mobile US (TMUS), Voya Financial (VOYA) and YUM China (YUMC) will follow after the close. Apple (APPL) is expected to announce new iPads and Macs at an event in Brooklyn. The company will report fourth quarter earnings on Thursday. BP (BP) reported bumper results that were fueled by higher oil prices. The company said that profit rose to $3.8 billion in the third quarter, more than double compared to the same period last year. Lufthansa (DLAKY) cut its growth forecast and reported a 7.7% drop in earnings, attributing the performance to higher fuel costs, flight delays and cancellations. Economic growth in the eurozone slowed to just 0.2% in the third quarter, half the 0.4% rate posted in the previous three months. Growth in the wider European Union dropped to 0.3% from 0.5% in the second quarter. The euro weakened slightly against the dollar following the data release.